The concept of the Renown redesign was to give the series fresh visual appeal and enhance sonic performance, while preserving its classic Gretsch vibe and spirit. The Renown has been revered for its rock-solid craftsmanship and excellent sonic performance.Gretsch still uses the proven and unique Renown formula that combines North American Rock Maple with a slightly softer maple species. 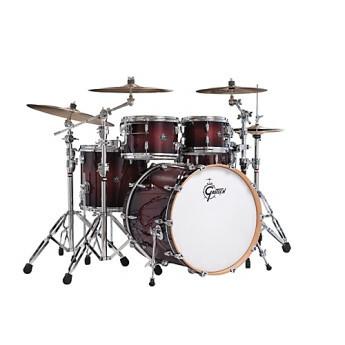 Each drum is expertly completed with smooth 30 degree bearing edges and Gretsch's exclusive Silver Sealer interior finish.Heavy-duty Gretsch die-cast hoops are fitted to all tom and snare shells and classic Gretsch lugs adorn each drum. This Gretsch-engineered shell/hoop combination produces explosive attack and power that is rich with warm, low-end timbre. The updated round, two-toned badge features gleaming silver artwork embossed over a black nickel background.Snare, cymbals and hardware sold separately.